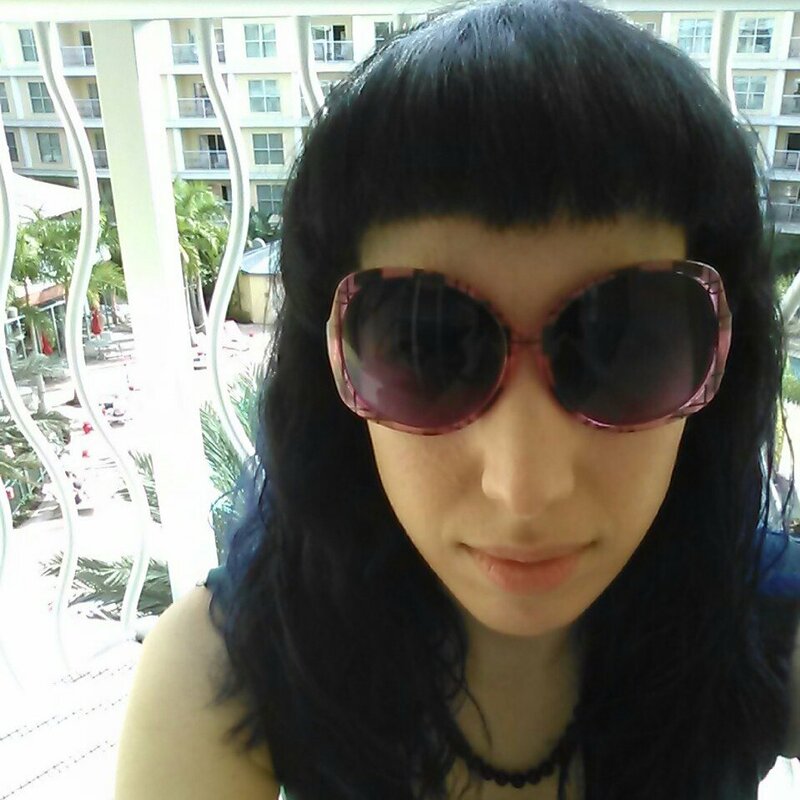 Here’s me and my new bangs enjoying the balmy weather without enduring tanning, from the safety of our balcony. I’m happy to report that my dad is recovering very well from his surgery on Monday, which is actually the reason we’re currently in Celebration. It’s also about halfway between downtown Orlando, and Thomas’ hometown of Winter Haven, so it worked out pretty nicely. 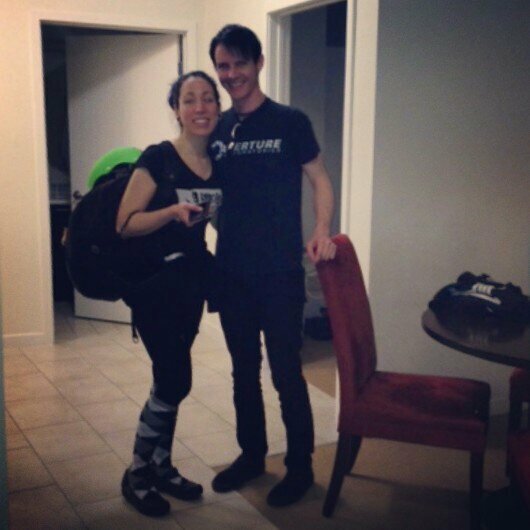 Right before we left Seattle, I did my first attempt at 27 in 5 (27 laps in 5 minutes is one of WFTDA’s minimum skills) and got a very respectable [for a 1st try] 24. Having had a week break due to Thanksgiving between my last two practices, I knew I didn’t really care for such a big gap between sessions, so I googled leagues in central Florida right before we left Seattle for our 9 day trip. 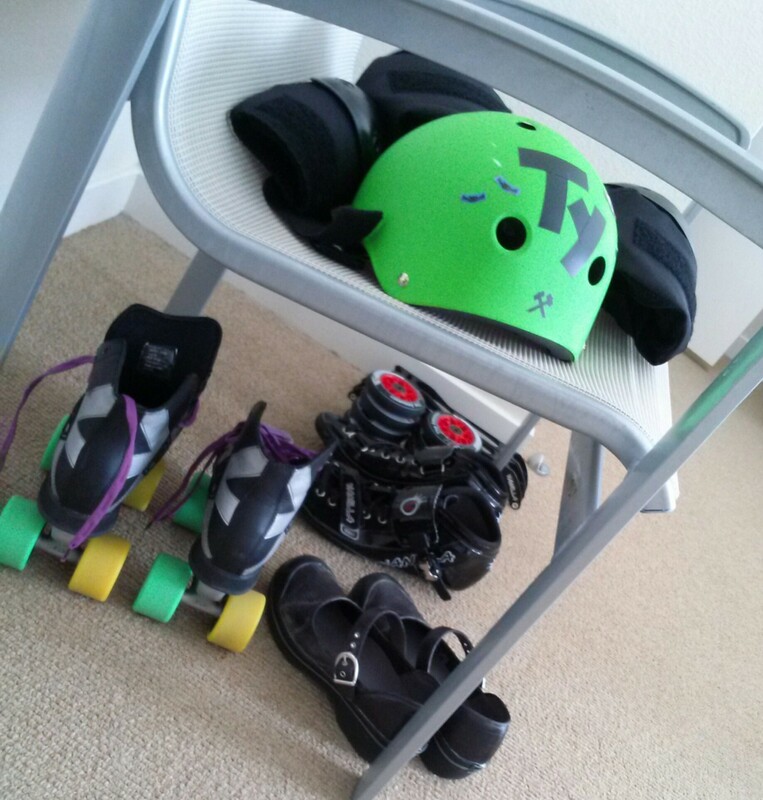 (I brought my gear backpack & helmet with me on the flights as my personal item with no issues.) Orlando Area Derby Revolution got back to me first, but unfortunately none of their practices coincided with my days here. Then I was lucky enough to get ahold of the Lakeland Derby Dames, who were willing to let me drop in on Wednesday night. The new place is HUGE! They’ve lost some of the greener, homier touches of the old place like the Dr. Bronner’s soap in the bathrooms and a patio area (from what I could tell), but it’s a really nice space with an impressively long full bar to boot (not pictured). Thomas went for the All American Burger $8.95, right away. He got his with the chips and mango salsa. He said it was all good, and that the burger tasted like Gardein, but we didn’t get conirmation on that. 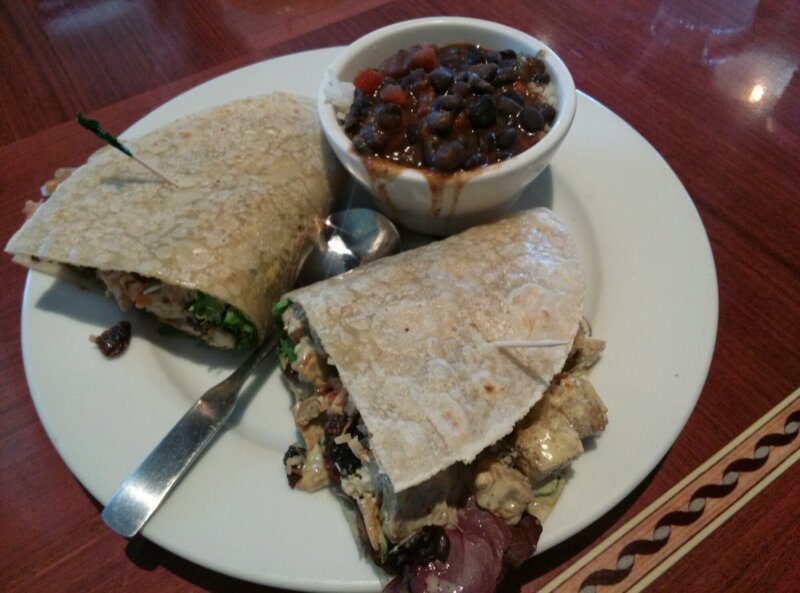 After some deliberation, I settled on the Coconut Curry Wrap $8.95, made gluten-free with a brown rice wrap, and upgraded for a side of black beans and [white] rice. I really liked the flavor of the black beans, even before the Tabasco & Sriracha, but did wish it’d come with the less authentic brown rice instead. The wrap was more like a soft taco, and a little diificult to manage without a fork, but I’m thinking it was just the way the brown rice wrap worked out. 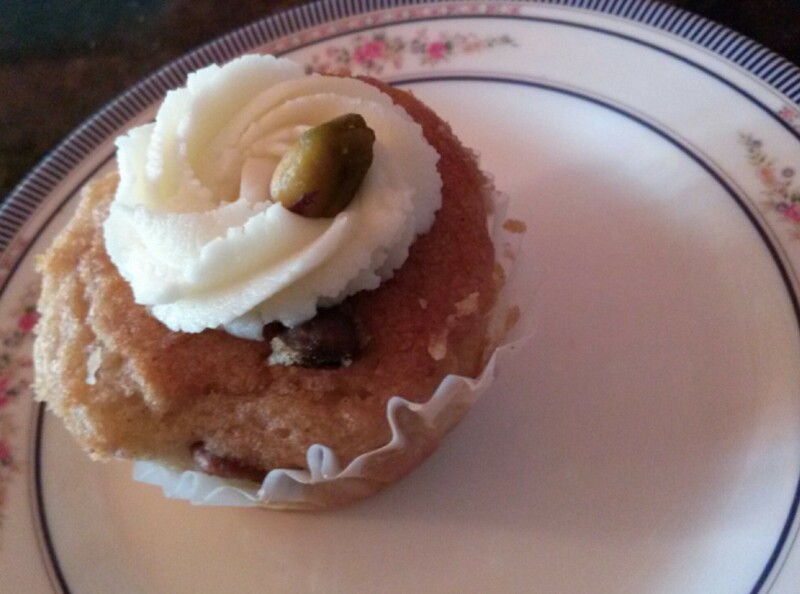 It was just a little salty for me, but the raisins and walnuts helped to give it some contrast. I liked it more the longer I ate, and ended up eating the whole thing instead of taking half home, like I’d originally thought. When it came time to leave for practice I was still pretty full. I got a little nap in on the way to Lakeland since Thomas drove, and cars make me nearly narcoleptic. Once it was time to go in, I didn’t give it much thought again until about halfway through. The girls were all really great and friendly, and I was super thankful for the awesome endurance practice they gave me. About halfway through I did feel a bit nauseated, so I’m not sure if it was the overeating or all the vegenaise or nerves, or all of the above! 😉 I did make it through their whole practice though, which I was super proud of since I’m not on a competetive team yet, and just a week shy of three months in. If you want to check out their team, the Rockabilly Rebels, watch their quick video, here’s the link on Vimeo! Like it if you can, because they’re trying to win a contest! And if you’re interested in joining them, they have a recruitment night coming up on Monday! Still haven’t been in the pool yet, believe it or not! Last chance today! Hey all! 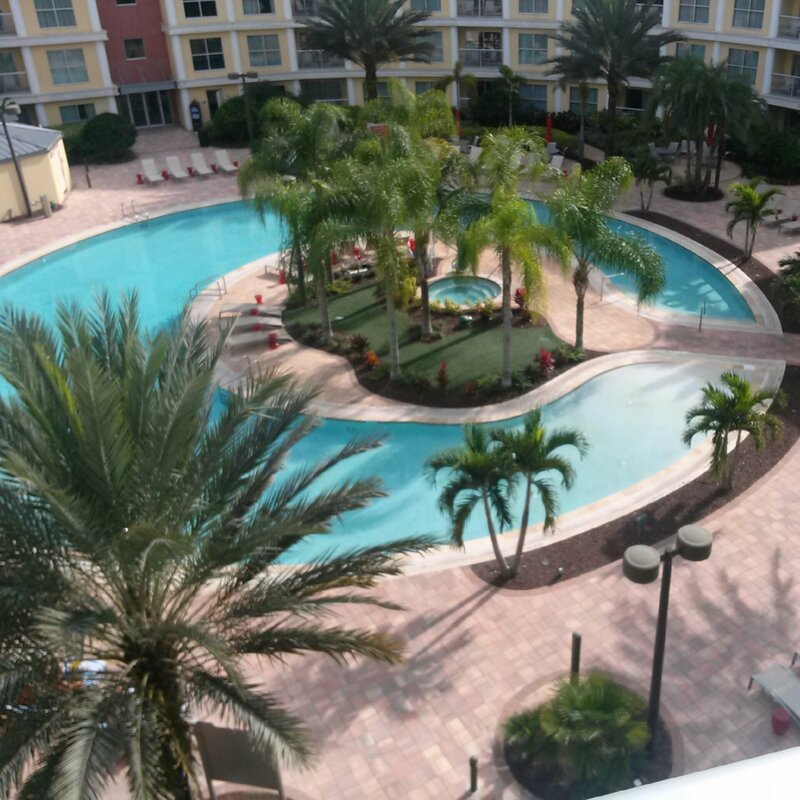 I’ve been MIA all week because we’re MOVING TO FORT LAUDERDALE tomorrow, and we only had a week to pack! We didn’t think that we were moving until next month, so it’s been a little frantic, but fun, and we’re really excited for the change of scenery. We’re still trying to relocate to Seattle this year or next, and we’ll be able to transfer our lease to Seattle from this place if and when we do find work there. In the meantime, we think we’re really going to enjoy our new place. We’re downsizing from a 2/2 to a 1/1 to save a tiny bit of $ and get used to a smaller space. So my kitchen will be downsizing too, but nothing will ever be as small as that Brooklyn kitchen that I started this blog in, so I’m not worried at all! Here’s the last review from our trip to Orlando that I didn’t get to put up. I apologize for the brevity. 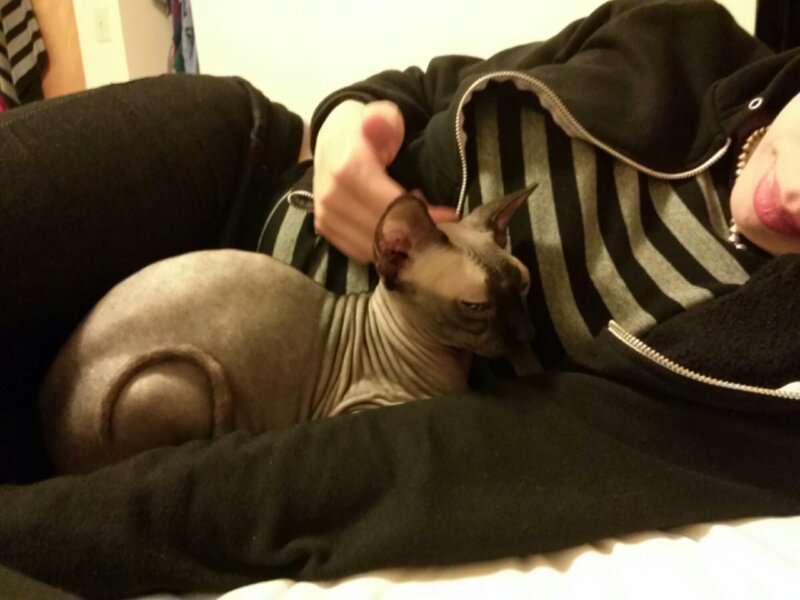 Hopefully I’ll be cooking & blogging again next week when we’re all settled! 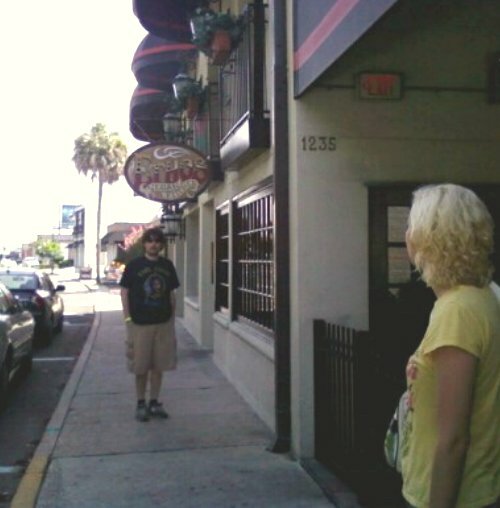 This was the last place we ate on our recent trip to Orlando. 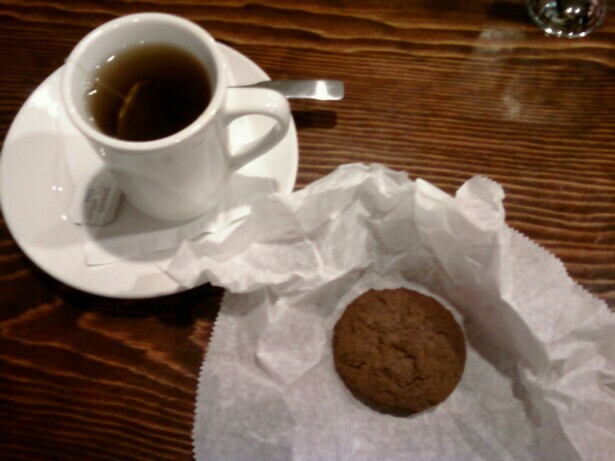 We can’t wait to get back, because there were so many other places that we could have tried, but the combination of being a tea house and serving a good variety of vegan options sold me, and I’m very glad about that! Their impressive collections of teas are served with a special tea timer so you know when it’s ready! 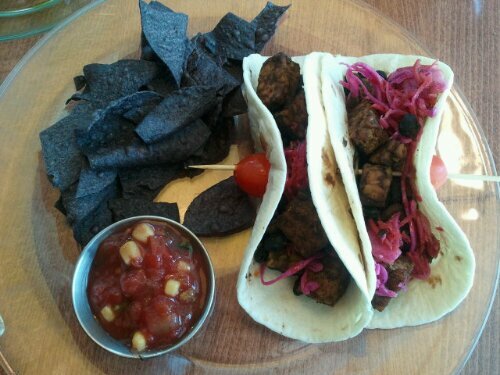 We split our dishes, and I have to say, while the burrito was good, the tempeh tacos were GREAT! They even have an all vegan chocolateir located in the shop with it’s own refrigerated case. We had a really nice lunch, and there were many vegan offerings. This is definitely a good place to eat, drink tea and hang out. Infusion Tea is located in College Park at 1600 Edgewater Dr, Orlando, FL 32804. 407 999-5255 Open Mon-Sat 9a-9p, Sun 12p-6p. 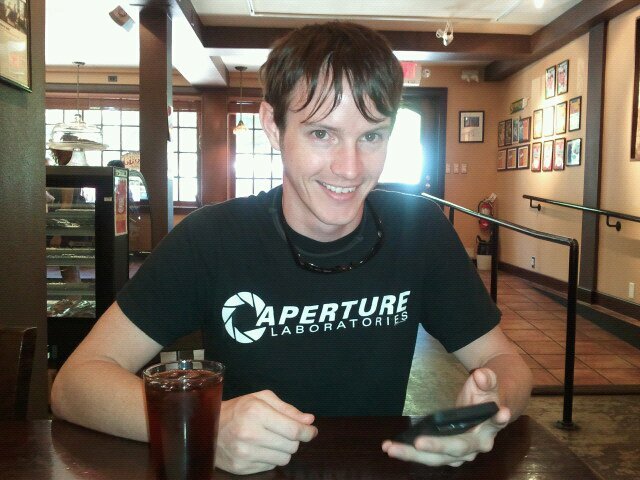 We met up with Jeremy Sunday morning at Ethos for brunch. I’ve dined at Ethos before with mixed reviews, but if there’s one thing they do extremely well, it’s brunch! Seriously, I don’t think there’s a bad thing on their brunch menu, and you could tell I wasn’t the only one who thought that because it was absolutely slammed when we got there. The line to the register was wrapped around and lengthy, but it went quick. The weather had dropped 20 degrees over night, so we opted to sit in the less crowded patio to enjoy the brisk weather. They had a DJ out there playing some chill records. Jeremy’s breakfast burrito came smothered in gravy and stuffed with tofu scramble and other goodies. 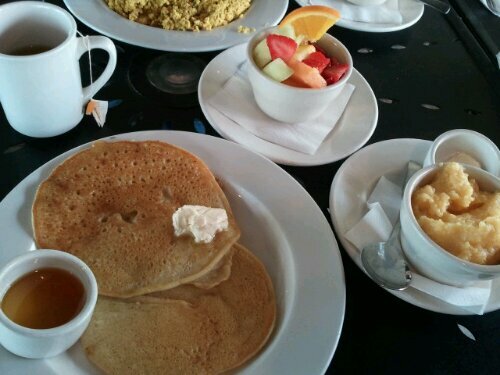 I ordered vegan pancakes with agave syrup (maple available too! ), some grits and a fruit cup. 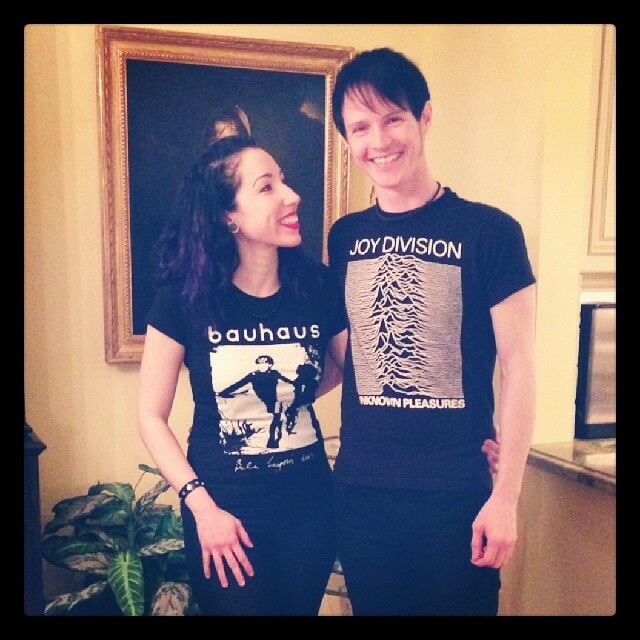 This made me very, very happy. The grits were even better with some of my extra agave. Mmmmm! Thomas got the tofu scramble, which I’d had before and knew was good, and some grits too. The scramble and potatoes were exactly the right texture and perfectly seasoned, and he thought the grits were especially good too. Win! 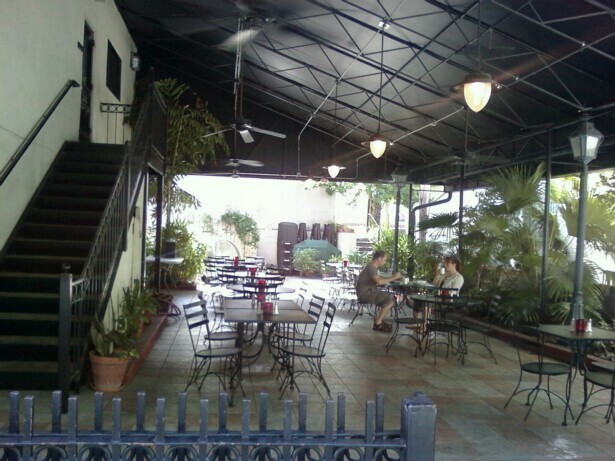 Ethos Vegan Kitchen is located near the antiques district at 1235 N Orange Ave Ste 101 (at Virginia Ave), Orlando, Fl 32804. 407-228-3898. Open Mon-Sat 11am-10pm, Sun 10am-3pm. 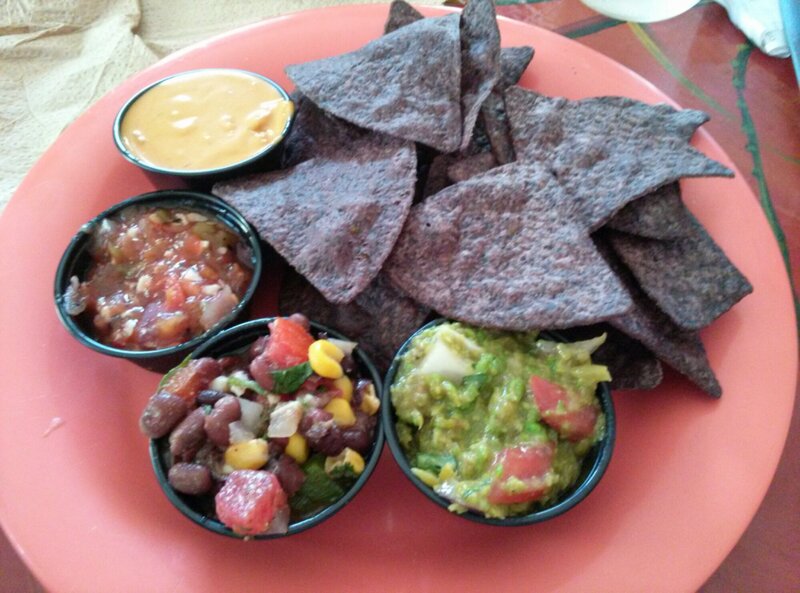 We had a slight change in our plans and ended up spending the day in Orlando on Monday, and then Tuesday in the Magic Kingdom, so I decided to pay a visit to the College Park area’s dedicated vegan restaurant, Ethos Vegan Kitchen. I hadn’t been there since last year (previous review), and was glad for the opportunity. We were both pretty hungry so we ordered fairly heartily. An appetizer, two entrees and some cookies to go. 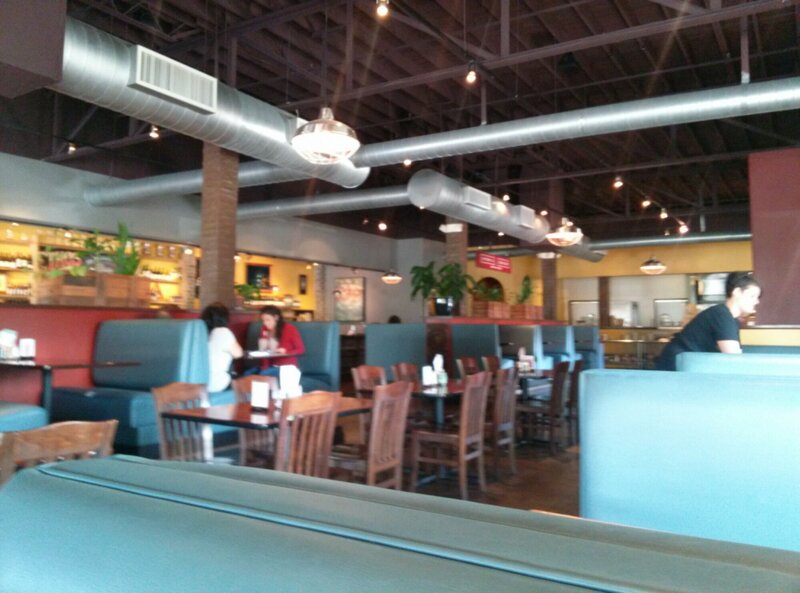 Ethos is a good size restaurant with plenty of indoor seating and outdoor seating to boot. This was awesome! 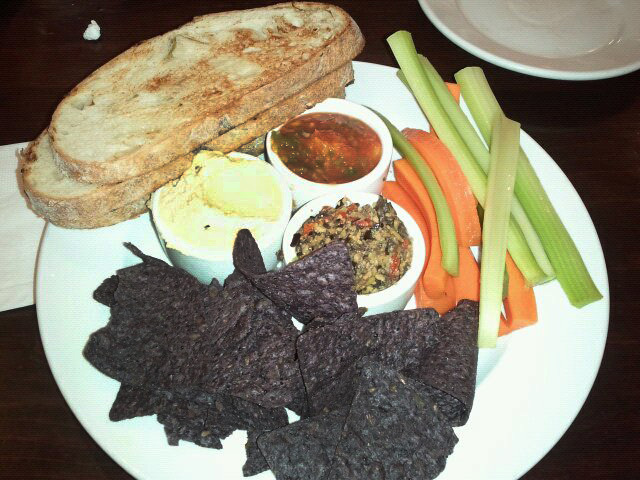 The bread was great, the tapenade was wonderful, the hummus yummy and the salsa good too. This was pretty good, a little different than what I expected. The dish ended up a bit sweeter overall than I’d imagined. 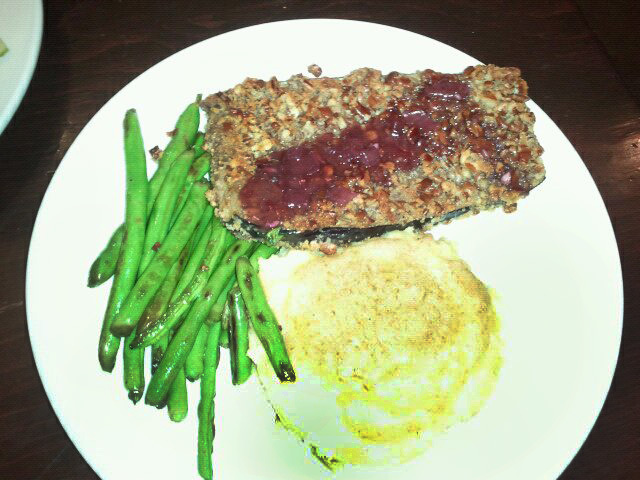 I wish the eggplant was a little more seasoned to contrast the pecan/wine reduction, but still good. The gravy on the mashed potatoes was sweetish too, which was a little odd. 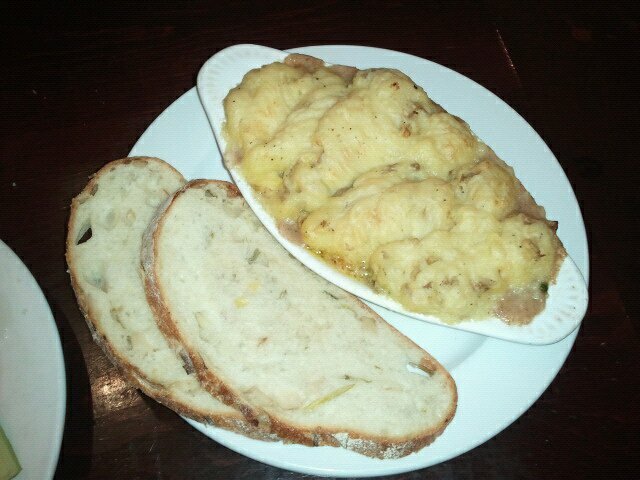 The potatoes were good without it. This was served piping hot, and it took Thomas a little while to be able to get a bite in. When he finally did he looked kind of dissapointed and said that it could really use some TVP. Hah ; ) It’s true. He was right when he said “it’s like the sides mixed up in one dish”. It would be nice with an Add Seitan or Chickun for +$2.50 option like they have for their pasta. It really begs for a protein, but it still tastes good. 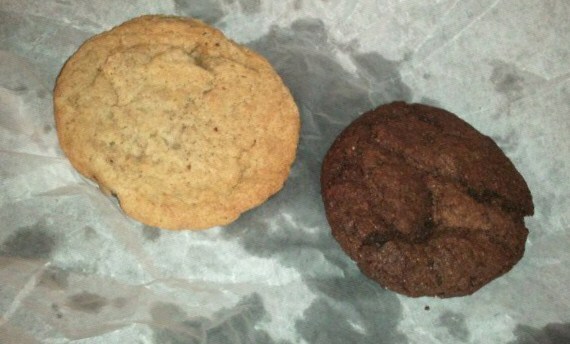 I also picked up a chocolate chip cookie $1 and a chocolate chocolate chip cookie $1.50 to eat later. 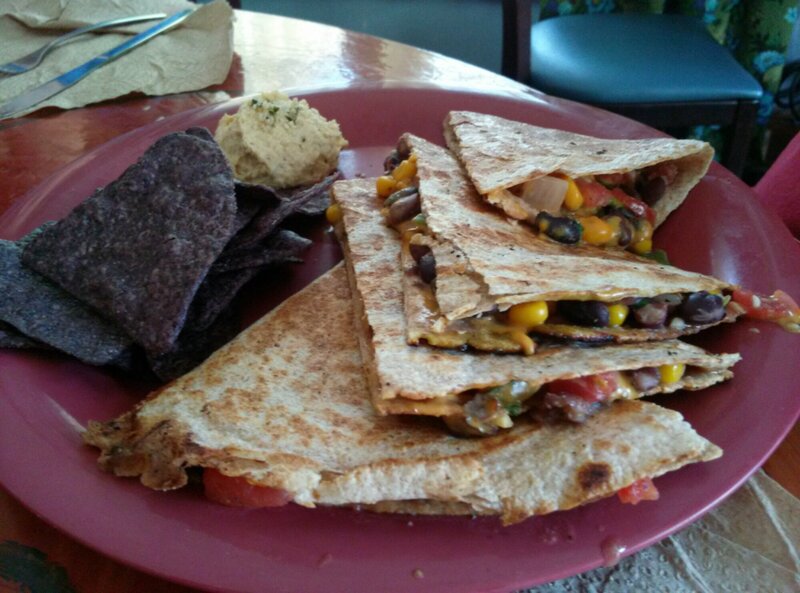 cpv goes to orlando: ethos vegan kitchen review! 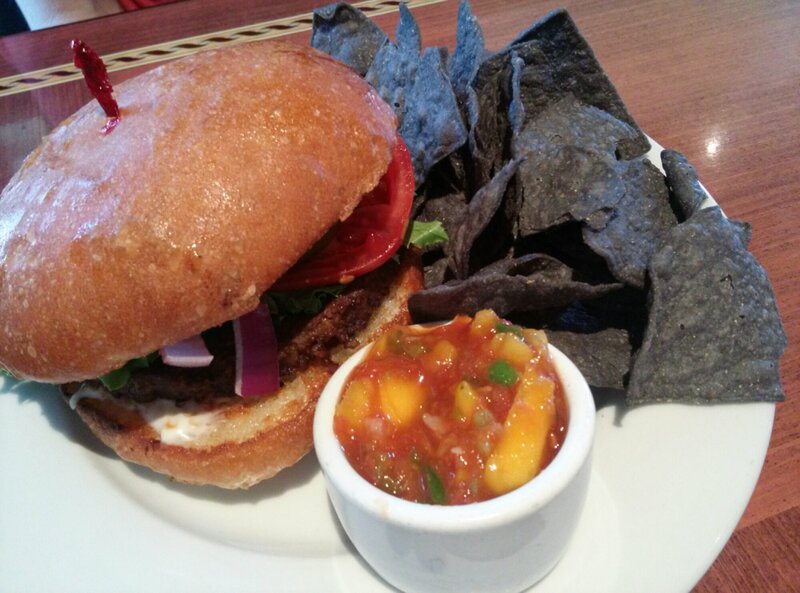 something wonderful has happened to orlando… it has become vegan friendly in the last few years! i’m even finishing up some very delicious vietnamese vegetarian pork leftovers as i type this to you now. the vietnamese part, that’s not new. if you are driving down 50/colonial, just east of orange, there is a vietnamese strip of restaurants and shops that’s been there forever. but just east of that, there’s now a loving hut. i wasn’t in a huge rush to go to loving hut, since i’d already tried the one in NYC, and thought it was just okay. 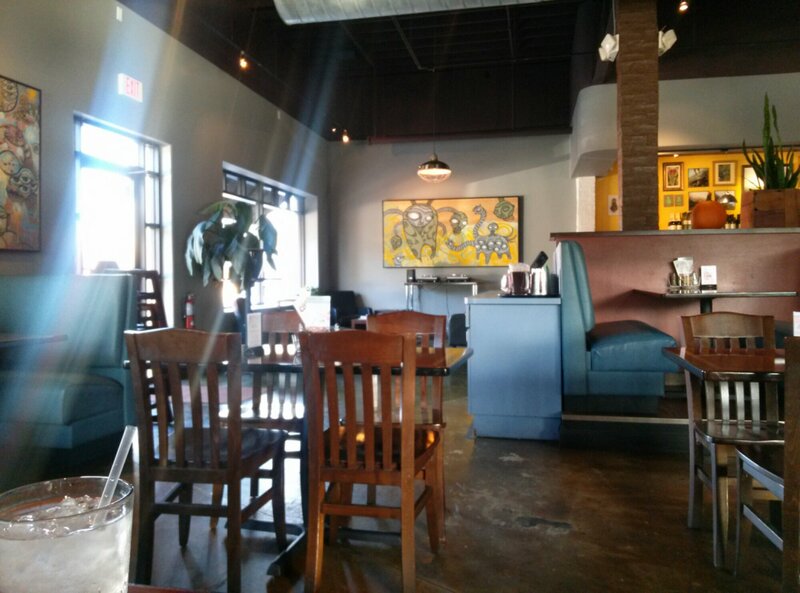 however, there’s also a new hot spot over by O-town’s antique district: ethos vegan kitchen. ethos vegan kitchen is a really cute little place in a hip part of downtown. it’s a few blocks before white wolf cafe. and as ash put it, is full of what seems to be all the hipsters, hipster families, hippies and lesbians in town. it’s a casual, walk-up and order type place that then gives you a number and brings the food to your table. there is both indoor and outdoor seating. the staff is really friendly and happy. the menu is limited, and has both hits and misses. if you ask for a glass of water, you get to have bottled water from their cooler. best of all, i found out today that the owner runs a vegan hot dog cart downtown for all the hungry people coming out of clubs and bars! super awesome. jeremy (omnivore) says he’s had them too, and that they are not only good, they’re cheaper than the meat dogs, and give you an array of topping choices. jeremy really liked his chili, and bobby & mary were super impressed with their phillies. 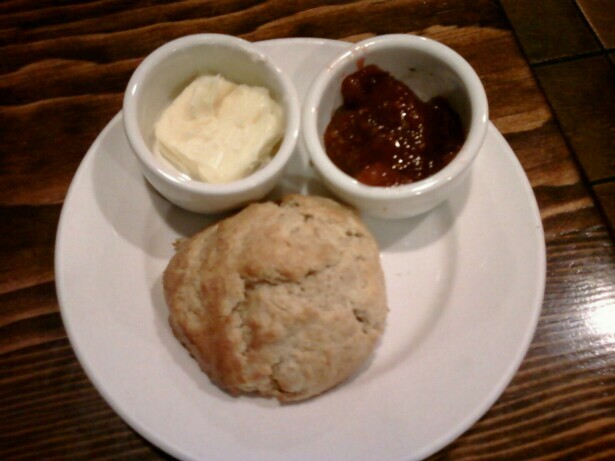 the biscuits were AMAZING, albeit greasy, but hey, this is breakfast food. they came with a totally delicious jam, but i’m not sure what the flavor was. 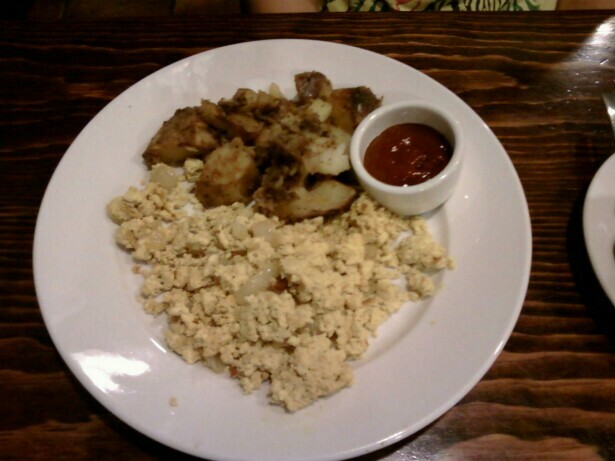 jeremy liked how smoky the sausage gravy was, and the tofu scramblers thought that theirs was yummy & well seasoned. the homefries were nicely seasoned and cooked. overall delish. 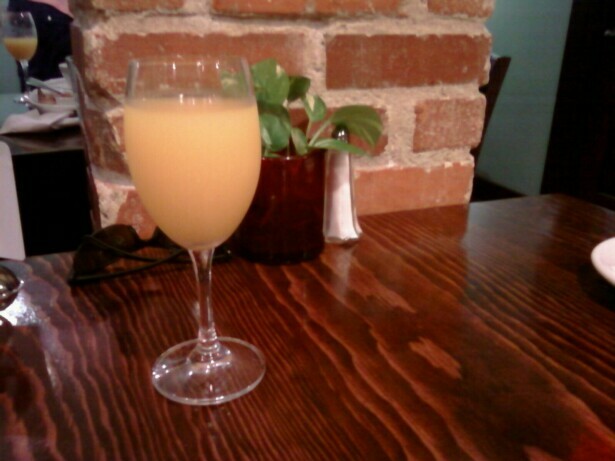 jeremy also had a pretty fruit cup & mimosa too. for me, although the cheese steak was tasty, the seitan was so greasy it sort of killed it. i could literally squeeze butter out of my soaked ciabatta roll by pressing with a fork. bobby & mary felt this was allowed, because it was after all supposed to be a cheesesteak. 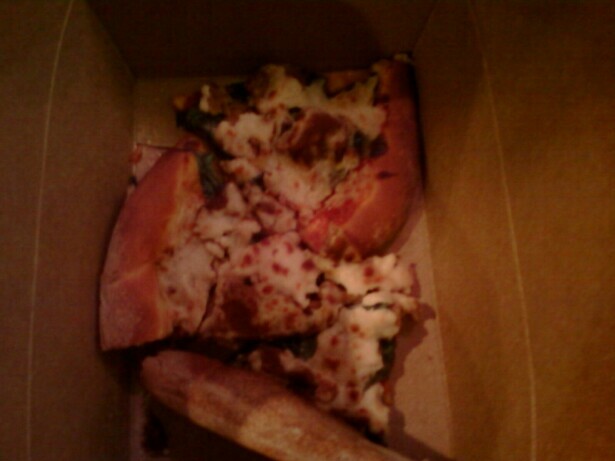 laura also had an entirely greasy, and thus soggy pizza. 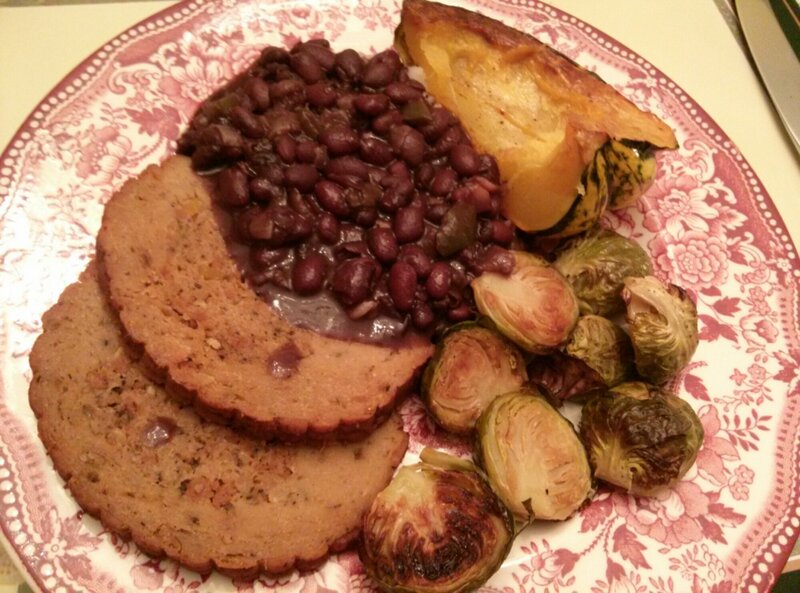 she did get seitan as a topping though, and i think this was the root of all the problems. the preparation is just WAY to oily! ash was equally unimpressed with her mushroom wrap because the mushroom was completely waterlogged and dripping through the wrapper. she was also dissapointed that her fresh fruit side was just a slice of watermelon. she was expecting variety here. 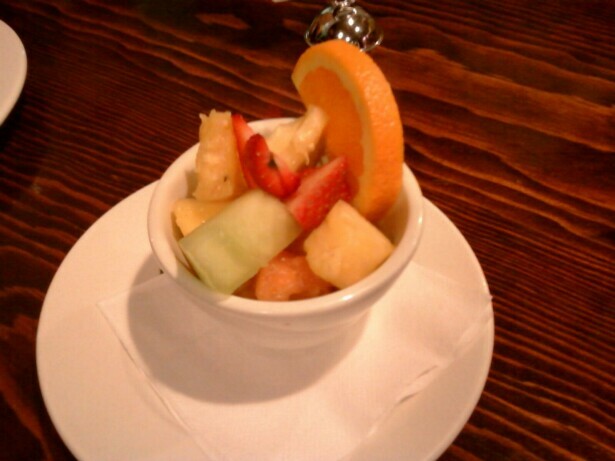 well, more like jeremy’s brunch fruit cup. my coleslaw was uncontested as the WORST! i was so excited too when i saw it on the menu. but it literally tasted like slaw mix DROWNED in veganaise. no seasoning at all. just some slaw and a ton of vegan mayo. bleh. mary actually referred to it as abysmal. bobby thought it was awful, but put hot sauce on it and made it disappear. 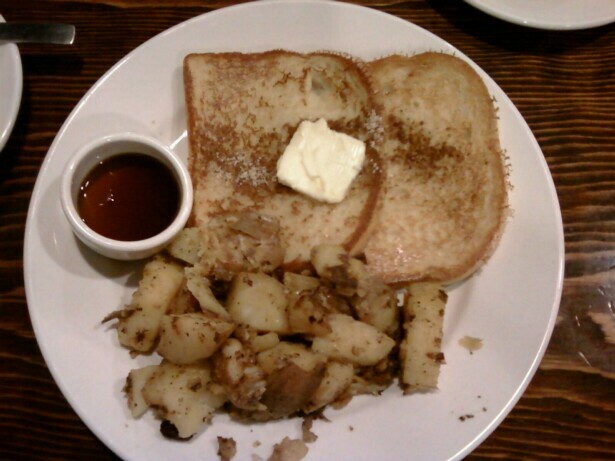 Brunch: french toast and ginger snap. 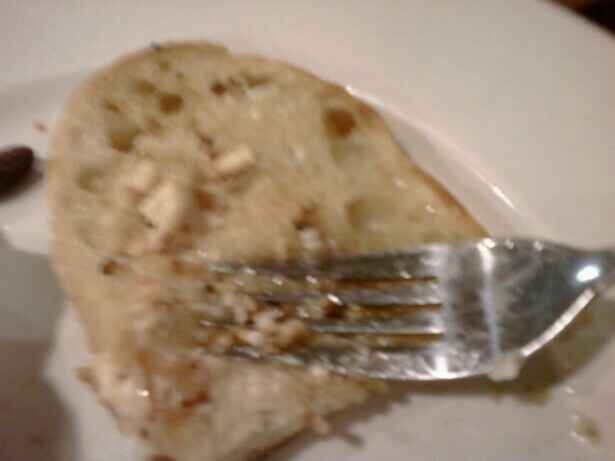 the french toast was okay, just soggy. it still tasted good though. the ginger snap lacked flavor.